(Nanowerk News) This past November, NASA launched the Mars Atmosphere and Volatile Evolution (MAVEN) mission in the hope of understanding how and why the planet has been losing its atmosphere over billions of years. 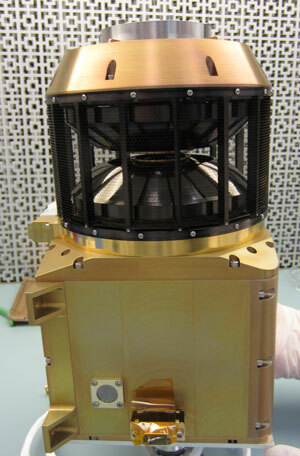 Once the MAVEN spacecraft is orbiting Mars, the Solar Wind Ion Analyzer (SWIA)—which was designed and built at the University of California, Berkeley Space Sciences Laboratory (SSL)—will spend much of its time measuring the ions in the solar wind. Released continuously from the sun's atmosphere, the solar wind travels toward Mars at speeds around a million miles per hour, carrying with it a magnetic field that originates inside the sun. It is composed of charged particles that interact with neutral gas particles in Mars' upper atmosphere, giving them the ability to escape from Mars' gravitational pull. The ionized gases in the solar wind—known as plasma—can interact with the wind's magnetic field to form an electric field, and accelerate the newly charged particles in the atmosphere with enough energy for them to escape. While both the electrons and ions form this plasma, Halekas said the ions are in some ways more important, thanks to their larger mass. Halekas said SWIA was perhaps most complementary to the Suprathermal and Thermal Ion Composition instrument (STATIC), which will measure the planet's ions—including those escaping—while SWIA focuses on the ions from the solar wind. SWIA will also work closely with the Solar Wind Electron Analyzer (SWEA), which will measure the electrons in the solar wind and how they affect particle escape.